I was thinking that since we started Lucinda's Country Inn in September 2004, we have had the pleasure of having several cyclists stay at the Inn. All those staying with us have been going west to east. These latest guys are following the Western Express Trail that meets with the TransAmerica Trail in Pueblo, Colorado. The Adventure Cycling Association (ACA) maps show them the way. 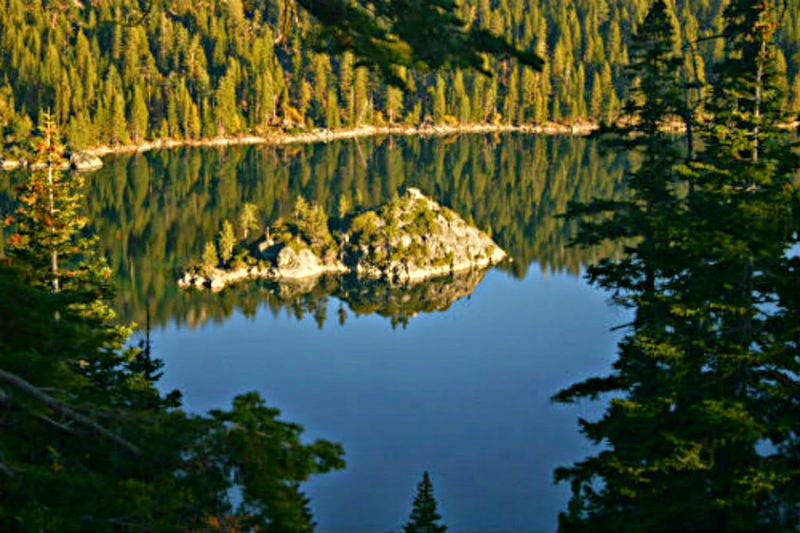 (We are now listed in the ACA maps as an excellent place to stop overnight or make a day stop to rest before the hard journey over Carson Pass at 8,500 feet about 35 miles up the hill.) Starting in San Francisco May 25th this latest trio will finish in Yorktown, Virgina, a distance of approximately 3,800 miles ending sometime in late August. This trio, Frank Garber, Robert Birgance, and Gus DeSilva, met each for the purpose of making this trip. Frank and Gus met a couple times over the past year to discuss some details of the trip and had video conferences with Robert. All three met face to face the first time in SF for the "Dip of the Wheel", a ritual cyclists do to start their coast to coast journey. They gather at the Pacific Ocean so they can officially start their adventure. This is from Frank's blog. I forgot, like an idiot, to take a pic before they rode up the hill. If you want to follow their trip, via each one's blog, you just have to click here . 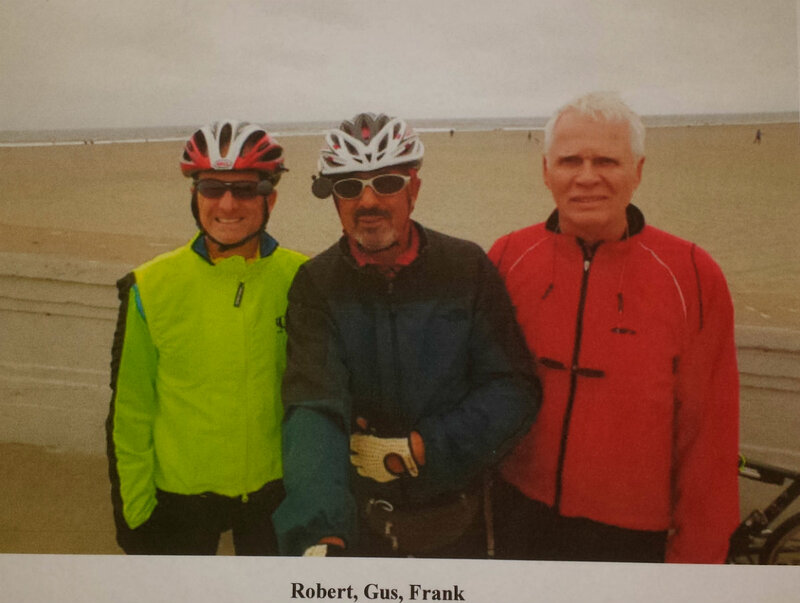 A brief bio of each is appropriate as all are retired and they are the oldest cyclists we have had stay with us. I admire their drive and enthusiasm for their journey. Robert has been officiating high school lacrosse and had the privilege to travel to Montreal, Quebec, Canada and Basel, Switzerland to do just that. He has been training for his coast to coast effort for over a year. Gus now lives in Concord, North Carolina, being a transplant from NYC. There he rode in the Five Burroughs Ride in 2012. That is a trip through all of NYC along with 35,000 other riders and thousand of residents cheering them on. Frank was a runner most of his adult life until 2007 when knee surgery sidelined him. He started biking and now is an avid rider in many trips with groups along the east coast. He lives in Potomac Falls, Va, close to DC. The three met through the ACA communication network and partnered to make this trip. Not long ago we had a solo rider doing the west to east trip, he was from Norway. A father son team ventured this way on their way to Pennsylvania, raising money for the preacher father's church school. They were on the trip to raise $100,000. Their trip had some bumps; the son became dehydrated going up highway 88 and had the support car take them back to Vallejo for a few days. Then they returned to their last spot and continued all the way. Dad lost about 50 pounds. Good for him, because he and I talked and compared our zippers; our heat by-pass scars. I just need to join him in losing 50. We had two young whipper snappers ride into Fair Play on their long bike trek across America to make it to Utah then calling their cross country trip a western leg, with the Midwest and eastern legs to come in future years. It's always fun to talk to the riders and find out why they are doing what they are doing. I also yearn to see America up close and personal. I will just use my car. I was thinking that most people who come to Fair Play come to enjoy the wineries and not watch the skunks cross the road. We do have our share of road kill that the buzzards like to gnaw on while we drive by. Some of the road kill are squirrels (I call them Rocky, after Rocky & Bulwinkle.) The other wildlife is more attractive than the buzzards and less of a hassle to live with. At times though almost all of them become road kill by being ran over or like the deer (Bambi) prancing out to collide with our cars before we even have a chance to see what hit us. If those skunks I mentioned earlier don't make it across the road we have our favorite fragrance for hours - that's why I call them "Flower", just like Bambi's friend. Once in a while a "Wabbit" (as Elmer Fudd says) just didn't quite make it around the curve far enough to get free. "Thumper" (Bambi's friend) gets thumped by one of the high rise, big wheel pickem'-ups. That is Life in Fair Play when all those visitors have gone home. Life in Fair Play is quiet and we must come up with our own amusement. One of my amusing things is to count and name road kill. Seriously, the reason we call Fair Play home, not just Cindy & I but all the other folks in Fair Play, is the beauty and tranquility. Some of the homes and wineries are situated on hills so they get the great panoramic views. Most of our homes are located in the nooks and crevices of the hills. We can watch mother nature up close and personal. Sometimes it gets real personal when a critter wants to make it's home under a deck, in a planter box or almost wherever there is a little hiding spot to build its home. Deer love to be under our rear deck. Last year in our east culvert, the opening is just outside the dining room window, a fox had his family housed in that culvert. This spring a skunk does. Of course birds have nested everywhere, even directly over one of our favorite sitting spots. That pretty much covers the animal life. Oops! Speaking of wildlife, our not so wild "lioness" Daisey stays outdoors most of the time. We see her stalking her prey, be it birds, gopher/vols and her favorite is baby turkey. When she gets too close momma turkey gets Daisey out of the way in a hurry. When she thinks she sees or smells something she assumes THE position, ready to pounce for the kill. She gets small birds and vols regularly, as we get up in the morning we usually find Daisey's gift on the door mat. Recently she stalked the culvert only to find a different smell - skunk. She sprinted up her tree to hide. Now for more of the human side of Life in Fair Play. If we aren't out visiting our winery friends in their tasting rooms or meeting others for lunch on a deck/patio or at Katie's Country Cafe or Gold Vine Grill, you can find Cindy and I having our lunch on our back deck or at the dining room window with the shades open. Just looking into the trees to enjoy the quiet solitude is exquisite. But when that sound of silence is broken by the rustling of the cedar trees, pine needles and oak leaves swooshing to announce the impending breeze that just moments later wisps across our faces; ah, that is the sound of nature in its fullest glory and is the real Life in Fair Play. Other adult things the people in the area do is gather for the infrequent meetings of SWAP. That is when about 20-50 people gather at the nearby Pizza Factory to have the Somerset Wine And Pizza (SWAP). All of us who attend are known as SWAPPERS because we partake in the SWAP, an evening of pizza & wine, mixed with fun and laughter. The emails that slam around, and the FB posts, after one of the gathering is hilarious, though they are not fit for printing in this blog. Some of those same humans beings are an active part of The Greater Fair Play Petanque Association. There are several petanque courts in the area so we move locations to have late afternoon matches to enjoy the cool summer evenings. Cindy & I have the only perfect record in the GFPA, a perfect goose egg for wins. All in all the folks in Fair Play and the neighboring areas are greatly diverse in age, former lives, orientation and marriage. Getting together to share fun, food, wine and gossip IS the Life in Fair Play. I was thinking about how our guests get here to Lucinda's Country Inn. Like most places people visit they travel the highways and byways until they get somewhere. Or when folks travel by train they zip through previously unseen countryside until the train slows in order to arrive at the worlds biggest and most beautiful cities. When flying to those same cities the passengers don't have a clue about what lies below them. As trains are slowing to enter those famous cities they jerk and bump along the tracks past some of the most god awful places to look at: wrecking yards, empty dilapidated warehouses with graffiti everywhere, slums filled with snotty nosed kids playing in the streets, cardboard houses, piles of rubbish - some of it human excrement - and lots and lots of other unpleasant sites. What seems like forever is suddenly broken by the train station coming into view. Thank god that part of the train ride is over, is what most travelers say to themselves with their sighs of relief. That brings us to you getting here to Fair Play. Driving from Nevada you lucky folks get to see the most beautiful site in the world; Lake Tahoe. Those drivers from the Bay Area get to drive through the largest valley and agricultural region in the US, California's Central Valley; which extends from Redding in the north to the Grapevine in the south. Here they grow almost every kind of produce and most of the world's supply of what they do grow. Once you get closer to Fair Play you can't help but see some of those kinds of things I mentioned above. When we started Lucinda's Country Inn county approval process we met with our County Supervisor. I asked her if we had to follow the County Ordinance and she replied, of course. Then I asked if it is required that we have 6-8 cars and lots of farm implements on our property. Of course not was her reply. Then why do so many properties have that at the side of their road? I inquired. She replied, with a chuckle, that just happens and she explained that those are called "Car Gardens".Those "car gardens" appear unfortunately on the roads to get to Lucinda's. One such "garden" is at the corner of Fair Play Rd. & Perry Creek Rd. at Pioneer Park. When you turn on Perry Creek Rd. and slow down you can catch the complete essence of what a wonderful job this place has done in creating their "car garden". It has taken years for them to make it look this nice. A lot of people spoke to them about the junk and made snide remarks and they have gotten a million dirty looks from neighbors. The Country Authorities cannot do anything unless there is a health hazard or a toxic waste problem. So we get this beautiful "car garden". 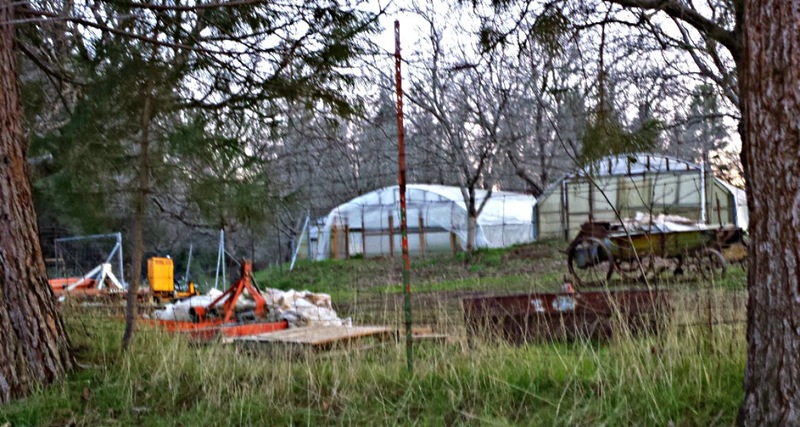 El Dorado County is a "Right to Farm" county. That means in the Agricultural Districts farming has top priority over any other activities. If you want to build a new home next to a farming operation your home has to have at least a 200 foot set back. It also means farm equipment can be parked, kept, stored or however you want to describe it anywhere on the property. Since most land is devoted to farming that means the areas along the roads are used for storage of farm equipment and whatever else the farmer wants to put there. Now there is mainly farm equipment here, along Perry Creek Rd., about 1/4 mile from the corner across from Pioneer Park. 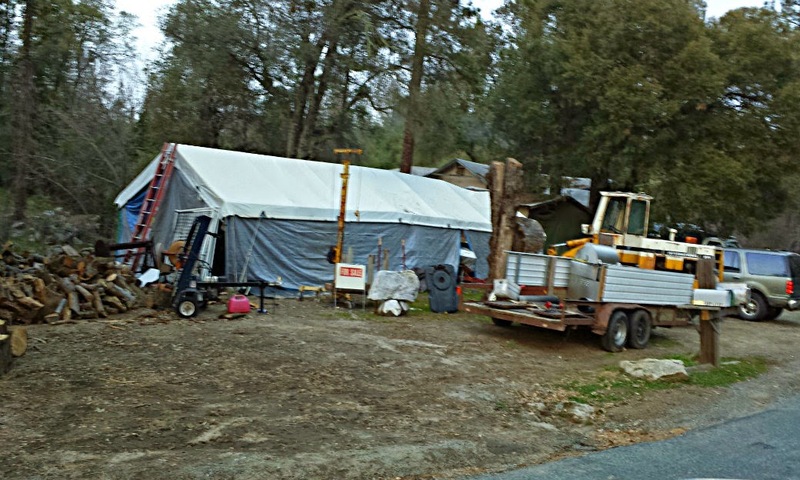 Ever since the owner has listed the property he has had his laborers clean the place, including a big dilapidated, dirty sign for Noah's Ark. And this guy went to one of our county hearings and complained about how bad our art & crafts house would look from Perry Creek Rd. UGH?? Wonderful part about your journey to Fair Play is when you arrive you can enjoy all the great wineriers and of course, Lucinda's Country Inn. Just some loving thoughts on Valentine's Day.